There is a Bible in medicine for interns. 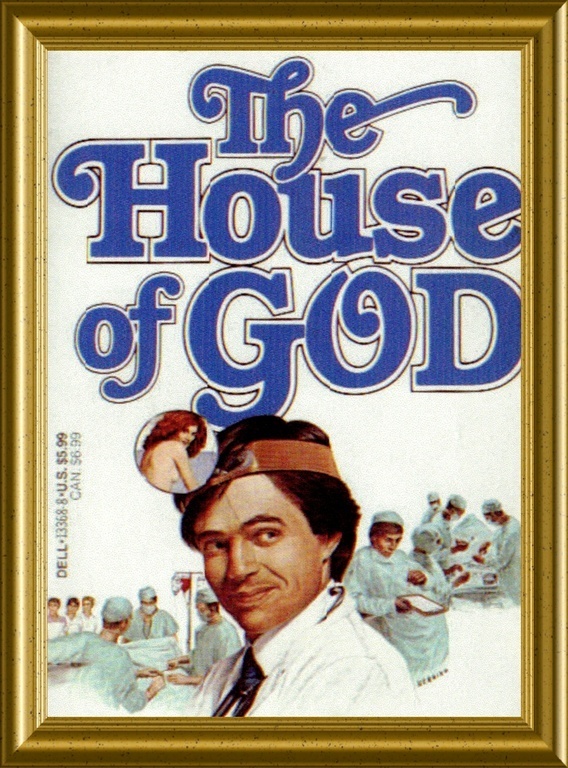 Published in 1978 by an intern doing his first year in internal medicine, The House of God is a cynical and hilarious look at the dehumanizing, cruel, and sad life that is residency. The basic plot is this: the semi-autobiographical main character, Roy Basch, starts his internship at a premier Boston hospital called The House of God, a very thin cover for the author’s actual internship at Beth Israel. A third year resident, Fats, takes Roy under his wing and teaches him that the only way to survive is to follow his “Rules of the House Of God,” thirteen seemingly-ridiculous dictums that eventually get Roy through the year. After the internship ends, Dr. Basch changes course and decides to be a psychiatrist. 1. GOMERS don’t die. GOMER stands for “Get Out Of My Emergency Room,” and refers to a very old, demented, sick person. Nowadays the phrase GOMER is taboo and derogatory; instead, we refer to these patients as SNF Bombs (pronounced “sniff bombs”). A SNF Bomb is a very old, demented, sick person who is brought in from a Skilled Nursing Facility with absolutely no explanation as to why. 2. GOMERS go to ground: Old people fall down and break bones. 3. At a cardiac arrest, the first procedure is to take your own pulse. Don’t panic. 4. The patient is the one with the disease. This is supposed to mean that it’s not your fault if the patient dies; it’s the disease’s fault. Also, at the end of the day, you get to go home. 5. Placement comes first. “Placement” is finding somewhere for the patient to go after they leave the hospital. 7. Age + BUN = Lasix dose. BUN is a lab test that measures kidney function. Lasix is the brand name of a common diuretic medicine (water pill). 8. They can always hurt you more. “They” refers to the GOMERs. 9. The only good admission is a dead admission. Dead people don’t require documentation. This is reportedly the ‘rule’ that most enraged the Harvard brass. It is, however, technically true. 10. If you don’t take a temperature, you can’t find a fever. 11. Show me a BMS (Best Medical Student, a student at The Best Medical School) who only triples my work and i will kiss his feet. 12. If the radiology resident and the medical student both see a lesion on the chest x-ray, there can be no lesion there. 13. The delivery of good medical care is to do as much nothing as possible. These rules have, amazingly, stood the test of time for 40 years. Many of them are still true. Shem did a remarkable job capturing how to survive internship. It’s 2018 now, and I got to wondering if anyone had made substantial updates to these timeless rules. I went googling for “revised rules of the house of god” and found a few articles. One was written in a medical journal for hospitalists. It was terrible and, predictably, not funny. A second was written on a popular medical satire website, GomerBlog (yes, it’s called GomerBlog because of the book), and was surprisingly lacking in the basic cynicism that made the Rules so perfect. As a near-survivor of intern year – I’ve been here, struggling upstream, for eight months now – with most of the difficult rotations behind me, I would like to propose a few changes. Here are my own, personal Rules for the House of, uh, Pain. 1. PLACEMENT comes first. Rule #5 has been upgraded to the top spot. There is almost no such thing as discharging an admitted patient to their home. Almost every hospitalized patient supposedly requires some variety of after-hospital care, and the euphemisms for “degrees of nursing home” are breathtaking: SNF, LTACH, rehab, recuperative care, board and care, ACLF. All are places that require approximately 900 hours of paperwork and six meetings with social workers and case managers before they will accept a patient and their Medicare dollars. Because of this paperwork burden, and because a substantial percentage of a hospital’s overall admin cost goes to this kind of “discharge planning,” PLACEMENT now wins out over patient care, self-care, and actual medicine as the most important Rule. 2. SNF Bombs (GOMERs) don’t die. This is actually more true, and more cynical, than it was in 1978, thanks to American society’s general refusal to have a reasonable discussion on dying and end of life care. I would illustrate this rule with a case or two, but my home institution is fanatical about privacy to the point that even having this website publicly available represents a Watergate-level breach of trust. I have been personally assured that our Chief Privacy Officer is going to chop off all my nonessential digits (middle and ring fingers, most toes) and feed them to his pet, HIPAA the Hippo. Nonessential digits only, because my thumbs and index fingers are needed to type medicolegally solid notes. Also, our hospital has a Chief Privacy Officer. Marinate on that for awhile. 3. The larger the wellness program, the poorer the wellness. In an effort to hide from the general public that residents work insane hours, are making life and death decisions on minimal sleep, and are paid less per hour than the window washers, hospitals have instituted large “wellness programs” designed to promote spiritual, physical, and mental well-being in the residents. It does none of these things. Mostly this program clogs my email inbox with daily emails about various upcoming performances, 5k’s, and meditation sessions. I can attend none of these activities, because I am working. Also, I am unable to unsubscribe from these emails despite my utmost efforts and expert-level filtering skills. We were actually shown this above picture during orientation. It is unintentionally brilliant. 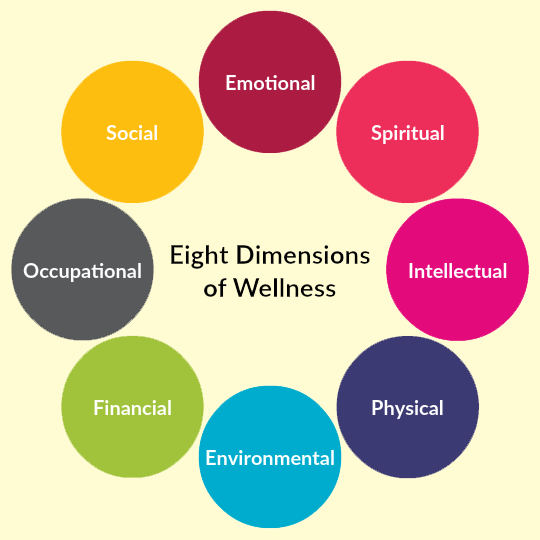 The four biggest detriments to wellness in residency – financial, occupational, social, and emotional – are all coincidentally aligned on one half of the circle. It’s an accidental, comedic yin and yang. Oops. 4. The system is the one with the disease. Patients have diseases, too, and the original House of God rule is still true. The truth today, however, is we spend far more time dealing with a sick and terminally ill healthcare system than we do treating the diseases of the patient. A few months ago I rotated on a regular inpatient medicine team. I had a patient who had no medical needs, but needed rehabilitation for an amputated leg. He didn’t have insurance, so no rehab facility would accept him. Instead, he sat in the hospital my entire two weeks, taking a bed that could be used for someone who was ill. Because he didn’t have, and couldn’t get, health insurance. Also, the above patient does not actually exist, and even if he did exist, he was admitted to a totally different hospital, on a different continent, in a different dimension, where there is no Chief Privacy Officer, or a pet hippopotamus that likes fingers. 5. Trust no one. Or, as House would say, “everybody lies.” The meaning of this rule is actually not so much that everyone is out to get you, but that you should not take anything for granted. An allergy gets recorded in the chart that isn’t a real allergy. The read on a chest X-ray is wrong. A lab result comes back that makes no sense and it turns out that samples got switched. You’d think this wouldn’t happen in a healthcare system that costs more per person than any other system in the world, and you would be extremely wrong. 6. Lasix Dose Equals Potassium Repletion. As I wrote in my very exciting post titled, “Potassium,” patients on diuretics like Lasix require potassium repletion. It does not seem to matter how, or how much, replacement potassium you give someone. This is despite many tenured professors in medical school warning me of the dangers of low potassium (you may die) and high potassium (you may die). I have yet to see anyone under my care die of either, but that is probably due to my top-notch expertise in repleting potassium. Anyway, “lasix dose equals potassium dose” seems as reasonable as any other algorithm. 40 mg of lasix equals 40 mEq (how we measure potassium units, it’s stupid) of K. Why not? It doesn’t matter anyway. 8. The delivery of good medical care is to do as much nothing as possible. This rule is also so much more relevant now than it was in 1978. When we started medical school, our professors told us, “50% of what we teach you will be wrong.” I have discovered that the vast majority of this incorrect 50% refers to the necessity of Doing Things. Here’s an easy example from (what else) the toxicology world: benzodiazepine overdose. Benzos, for those of you that do not routinely abuse sedatives (those in my current city or readers of Bret Easton Ellis can tune out, you know who you are), are calming medicines such as Ativan, Xanax, and Valium. If you OD on these, you can die, especially if you mix them with alcohol. However! In the hands of a highly trained and skilled emergency medicine provider, there exists an antidote! The antidote is called flumazenil, and it blocks the receptors to which benzos attach. Sounds great, right? A perfect antidote. Except, it turns out, if you ‘reverse’ someone who is doing their best Dead Ted Williams impression with flumazenil, it maybe can kill them too. The antidote can itself be lethal. So we basically never use this medicine. Instead, we do “supportive care” – which is, essentially As Much Nothing As Possible – until they sleep it off. This is all quite upsetting, since Doing Things is the part of my job I enjoy most. It also, in general, requires most of my nonessential digits. If Not Doing Things is actually the right Thing to do in most cases, my fingers are at severe risk of Chief Privacy Officer-mediated destruction. Also, my job will be very boring. Are you sure you want to order that TB test? I, for one, am not. 10. In a cardiac arrest, the first procedure is to clear the room of nonessential personnel. Medical professionals are a like moths to a flame. A code blue-colored flame. For some reason, we are all attracted to arrest calls, where we stand around rubbernecking like it’s plane crash. If a code is called on a completely deserted hospital floor at 3:30 am, you will be amazed at how many staff have been hiding in hallways, call rooms, broom closets, and bathrooms all night. If you want to attempt to restore a pulse, which is a bad idea about 80% of the time, the first step is to get the onlookers out of the way. I would have made a rule about medical students, too, but a) 10 is a nice number; and b) the medical school here is almost as powerful as our Chief Privacy Officer. Any snide remark would result in a swift death by bad evaluation. If you don’t hear from me again, it is likely because I am missing all of my fingers. 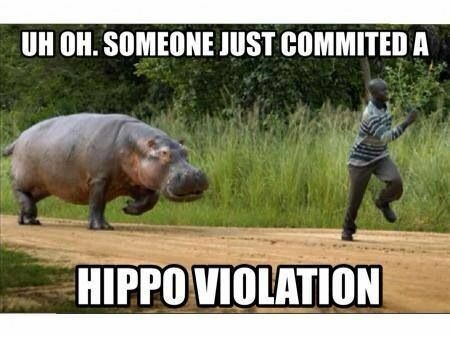 Finally, here is the hippo again, just because I like it.